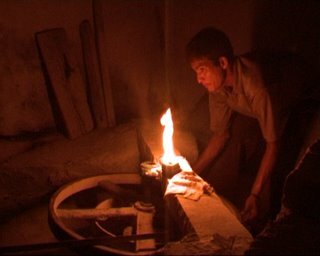 3 Men and a Bulb is a story of 3 men who earn a livelihood from their gharat (watermill) in foothills of Himalayas (Uttaranchal), India. The life led by these 3 men is meager, having access neither to electricity nor employment that brings regular income. Farming is very arduous, as supply of water is scarce. The gharat becomes a site, which each character wants to own and sometimes disown, in the quest for a better life. The story documents the 3 men’s personal hopes, anxieties and dreams set against the rustic life in the mountains. The narrative traverses their changing relationship with self and each other, offering exciting insights into human nature. It is a story of Rawat, Satya and young Harish. What happens when a rural economic system with a lot of promise is cracked up by administrative inconsistencies and individual enmity? What happens when 3 men who could have run the gharat and earned a comfortable livelihood, are moved by the inner voice telling them to leave and find a better source of income, a better life. 3 Men and a Bulb is a story about earning a good living, and a story about all the larger forces at work that don’t allow one to do so. This film began as an offshoot of my previous film, Gharat. It was a functional documentary film highlighting the potential of and the need for reviving the Gharats (watermills) as efficient indigenous technology. In strange and curious ways, the more time I spent with Rawat and his Gharat, I was convinced that my previous film could have been treated in a different manner both in form and content. The anger was both a frustration and a release. The frustration reflected in the fact that the issue based documentary form, which I was so used to, was insuffient to capture the essence in 28 minutes dictated by television. On the other hand, the release was accompanied by exploring a different form --a form that allowed me to test the boundaries of Truth, the real and unreal. People do all sorts of unimaginable things to earn one square meal daily. Rawat, Satya and Harish should be thankful that they have a genuine and efficient way of earning a livelihood. But some things clearly might ruin it for them – total lack of government interest in gharats, and as Rawat says, the ignorance of HESCO in periodically supervising the schemes. Add to this the personal insecurities of the 3 men, and a perfectly valid source of income, bulb, could go bust. A fiction film with roots in documentary; a documentary which unravels as fiction. The film is an attempt to construct a fictional narrative capturing the drama of everyday mundane life. The cinema verite style of documentary has been purposefully merged with the dramatic expressive style of fiction. 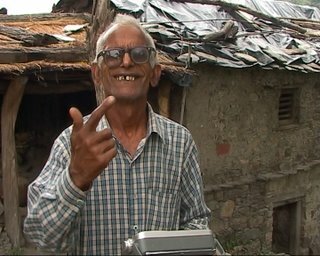 At the annual IDPA (Indian documentary producers association) awards "3 men and a Bulb" was awarded the Best Documentary prize for "its sensitive construction of a discourse on displacement and infrastructure imbalances, done with meditative aplomb at an extraordinarily restrained pace." In March, 2004, I was researching for my documentary film on the Gharats (watermills). It was a functional documentary film highlighting the potential of and the need for reviving the Gharats as efficient indigenous technology. While talking to villagers in Uttaranchal, I realized the struggles of the Gharatswamis, (Watermill owners) who not only revived their Gharats but also effectively used them to produce electricity. Often, the meagre electricity produced was distributed to the neighbours either free or for minimal charges that went into the maintenance of the Gharat. I found the relationship between the Gharatswamis and the villagers untainted by profit making and a model for the outside world to demonstrate self sufficiency and harmony. During one such visit, I met Rawat, at Tal village. He was old and a loner. His family was living in the near by town of Rishikesh (25kms away) but Rawat was adamant that he could earn his income reviving his ancestral Gharat. HESCO, a reputed NGO had helped him to revive it. Ironically, after initial praises of HESCO, Rawat started complaining about non payments by villagers for the electricity. I was taken aback by the calculative nature of Rawat. As he spoke, Satya his partner sat listening in silence. Harish, Rawat’s nephew, was indifferent in spite of Rawat’s repeated statements that Harish is going to take over the Gharat once he finishes school. I realized that there were a lot of untold emotions running in the manner Satya, Rawat and Harish were behaving. Their silence was uncomfortable and the only reason they were sitting under the mango tree was because of the Gharat. They were relying on it for their livelihood. On our way back, as we were moving away from the beautiful but hostile terrain around Tal village, I knew there was a film to be made following the lives of the three men whom I had just left behind under the mango tree. Later, when the film was made, the image of three men sitting under the mango tree became symbolic. They sat in silence, not uttering a word. I went back to Tal after completing the 28 min documentary on the Gharat. In strange and curious ways, the more time I spent with Rawat and his Gharat, I was convinced that my previous film could have been treated in a different manner both in form and content. The anger was both a frustration and a release. The frustration reflected in the fact that the issue based documentary form, which I was so used to, was insufficient to capture the essence in 28 minutes dictated by television. On the other hand, the release was accompanied by exploring a different form --a form that allowed me to test the boundaries of Truth and the conventions I followed in making my documentaries. 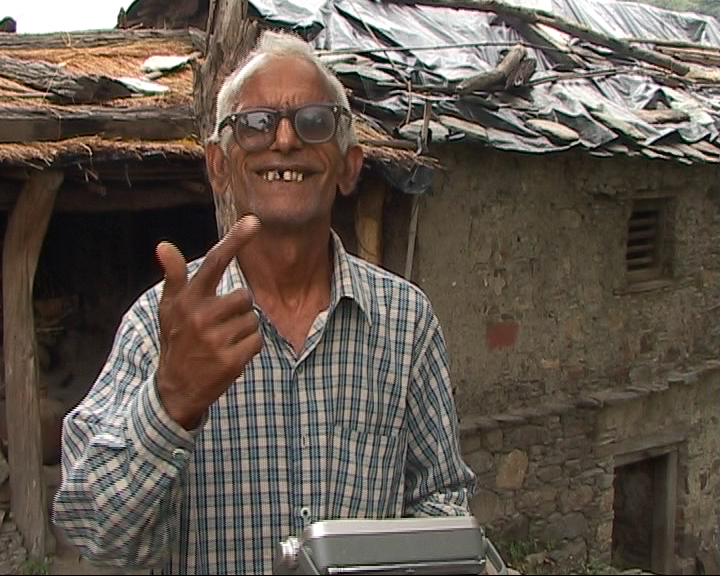 June, 2004: For the first few weeks, I kept the camera aside and spent time talking to Rawat. Satya would join us occasionally when there was little work at the Gharat. Harish made his appearance only during the weekends when he would take a long walk from his village to join his Uncle helping him clean weeds, farm and cook. Talking to each one individually, I realized that there was no animosity between the three except that each one was trying to come to terms with their own conflicts. Rawat was worried about his daughter’s marriage, his dreams about making the Gharat a tourist spot, forcing the villagers to pay their dues, trying to balance the accounts, and ensuring that Harish’s stays in school so that in future he can take charge of the Gharat. He spoke for hours, narrating his woes and experiences in the city. In contrast, Satya and I bonded immediately as he was curious what I did in life and how I earned my living. He was also very curious about the equipment too. As we shared our lives over hot piping rotis and aloo ki sabzi at his home, I realized that Satya was trying to comprehend the loss of his first wife, trying to adjust to life with his second wife, expanding his house, and trying to work harder to raise his monthly income. But throughout the shoot Satya refused to open up to the camera. He would mumble or just answer in monosyllables. In spite of making him comfortable, he just refused. Even, Harish was silent and observant. But unlike Satya he did not have much to say. His world was small consisting of his 2 sisters, stepmother, school and cattle gazing. He sparsely spoke about his dreams of going to the city for work or his lack of interest in pursuing an income from the Gharat. He would love the sweaters that I would take for him from Delhi. He would eagerly wait for me to return to Tal! Over the conversations, Rawat and Satya kept repeating that during the rainy season the place becomes very hostile as getting to the nearest village takes hours. The harmless looking dry riverbed next to Rawat’s hut gets flooded and violent. I was lured to go back during the monsoon. Firstly, I like rains. All my films have images of rains. This will have one too. Secondly, I was lured to get away from city life. No one could get in touch with me for days while I shot. The only way to pass on information was to call Rawat’s son in Rishikesh and leave a message. He would pass it to the jeep drivers plying between the forest and the village. (The only mode of transport plying from dawn to little before the dusk so as to avoid facing the elephant herd moving in search of water.) Such inaccessibility also proved to be physically taxing and called in for an intelligent pre planning of shoots. I had only two batteries. There was no way we could recharge our camera batteries in a village with hardly any electricity. If I was shooting with one, the other one was being charged almost five hours from Tal village in Rishikesh. August, 2004: I saw Satya’s happy and beaming wife. Later, he told me that he was about to become a father. They were expecting their second child. He also spoke about the ‘budda’ (the old man) who was being cleaver and cunning. On the other hand, Rawat kept mumbling that he was unhappy as the income from the Gharat was dwindling. Also, hearing that Harish was facing academic problems at school, we spoke to his teacher for extra tuitions for his forthcoming Board exams. October, 2004: Back in Mumbai, while reviewing the gathered footage, a larger structure of the film emerged. I realized that to present an authentic version of their lives, I had to treat Rawat, Satya and Harish as mere characters in the film. That is, the film will be an attempt to construct a fictional narrative capturing the drama of their everyday mundane life. The cinema verite style of documentary had to be purposefully merged with the dramatic expressive style of fiction. Also, I realized that the relationship between the three men was changing dramatically against the changing seasonal backdrop in Tal. Hence, I had to shoot with them over seasons to record their lives. Finally, I also predicted that due to regular repairs Rawat will give away the charge of the Gharat to Satya for a monthly payment. Satya, with a new member arriving in his family would try to take the situation to his advantage. On the other hand, as other young boys, Harish would leave his family in search of work in the city frustrating Rawat’s dream. Satya informed that he had a baby girl. Rawat was visibly upset about the running of the Gharat. Events transpired quickly, as one fine afternoon Satya and Rawat spoke about their new deal. Harish come to see me only once during my stay. Rawat told me that he was worried, as he had started bunking school regularly. January, 2005: Due to lack of resources, I knew that this would be the last schedule. Nothing new happened this time around, except the fact that the coldness of winter had crept into the relationship between Satya and Rawat. Harish too didn't show up. He dropped in one fine day just for a few hours and out of intuition I recorded my first and last interview with him. March,2005: With almost 80 hours of footage at my disposal, we started editing. It was like writing the script for a fiction film after finishing 90% of the shoot! Also, since the shoot was an ongoing process we could only flesh out scenes not knowing what was stored in the future of our ‘characters’. May, 2005: As I was making the first cut, I got a call from Rishikesh. Harish’s brother was enquiring if Harish had come to Mumbai as Harish was last seen leaving the village with his friend. Although such a disappearance of young men had become a normal phenomenon in the village, his family was heart broken to have lost their kid to the lure of the city life. Personally, it was the most painful moment in the making of the film. I was so emotionally attached to Harish because his silence reflected deep rooted boredom. His school was defunct; he could not relate what he was studying in school with the reality around him. The lack of food at home was pressurizing. As the promises from the Gharat were distant, he had to work to make both ends meet. In Harish’s story lies the story of distress migration because of faulty ‘centralized’ polices of our country. Hence, 3 Men and a Bulb is about Harish and a story about what happens when a rural economic system with a lot of promise is cracked up by administrative inconsistencies and individual enmity? What happens when 3 men who could have run the gharat and earned a comfortable livelihood, are moved by the inner voice telling them to leave and find a better source of income, a better life. 3 Men and a Bulb is a story about earning a good living, and a story about all the larger forces at work that don’t allow one to do so. The PresentI am yet to take back the film to Tal village as the film took almost a year to edit. I don’t know what has transpired in the lives of Rawat, Satya and Harish. But I know I will go back to experience the warmth and affection of people who opened up their lives for me. A few initial response of friends who saw the film was - ‘but nothing happens in the film!’ Yes, I agree. But I think the film records and reflects life as it happens. And in it lies the essence of documentaries. Where can I get dvd's of these films?